Professor Michael DeBow is a native of Tupelo, Mississippi. He received his bachelor's and master's degrees in economics from the University of Alabama (1976, 1978). He graduated from the Yale Law School in 1980, and is a member of the District of Columbia Bar. DeBow's career included a stint in private practice in Washington, D.C., followed by a judicial clerkship with Judge Kenneth W. Starr of the U.S. Court of Appeals for the D.C. Circuit in 1983-84. DeBow then served as an attorney-advisor to Federal Trade Commission chairman James C. Miller III (1984-85), and a special assistant to Assistant Attorney General Douglas Ginsburg, in the Antitrust Division of the U.S. Department of Justice (1985-86). 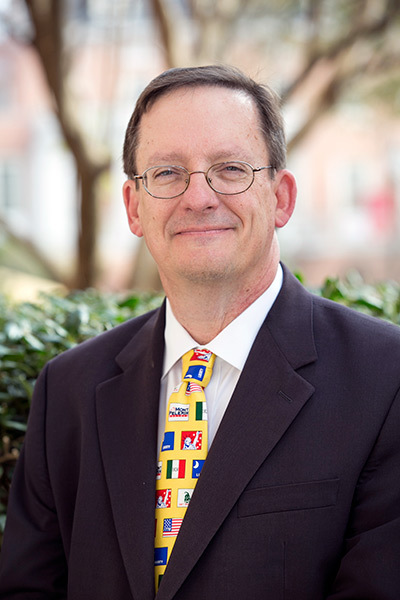 He began his teaching career at the University of Georgia business school, where he taught for two years prior to coming to Samford. From 2000 to 2004, DeBow also acted in a part-time capacity as special assistant for legal policy to Alabama attorney general Bill Pryor. He was a visiting professor of law at George Mason University in 1999. He was a (nonresident) Salvatori Fellow of The Heritage Foundation during 1993-95, and a member of the executive committee of the Association of Private Enterprise Education during 1995-99. DeBow attended summer institutes in quantitative methods for law professors (George Mason Law & Economics Center, 1990), Austrian economics (NYU Department of Economics, 1997), and the study of freedom (Templeton Foundation Freedom Project, 2000). In 2008 he was named an Adjunct Fellow of the Alabama Policy Institute. Professor DeBow has taught several undergraduate courses at Samford, including one which received a supporting grant from the John Templeton Foundation. Most recently, he taught an undergraduate course in law and economics for the Samford's Brock School of Business. He has also taught public health law for the UAB School of Public Health on several occasions. DeBow's articles have appeared in such journals as the Texas Law Review, Harvard Journal of Law & Public Policy, Regulation, Policy Review, The Freeman, and the Journal of Law & Politics. He co-edits the Federalist Society's Pre-Law Reading List and its annotated bibliography of conservative and libertarian legal scholarship. Professor DeBow's wife, Rebecca, is an Episcopal priest and associate rector of St. Luke's Church in Mountain Brook. They have two children, John and Claire.